This course will consider the production, formal qualities, and function of images in scientific books. The focus of the course will be on how and why images were made. Students will be asked to consider graphic technologies in terms of their impact on typography and layout and the ways that the illustrated book as a printed artifact influenced the development of scientific illustration and the history of science itself. Examples will be drawn from a wide range of scientific, medical, technical, and architectural books from the earliest years of printing to 1800, with case studies of illustrated books by such key figures as Vesalius, Galileo, and Hooke. The intention is to interpret the illustrated scientific book, not to provide a history of scientific illustration. Topics will include: the roles of authors and artists; the interrelationships of images and verbal texts; and the operation of diagrams, representational illustrations, and graphic displays of data in scientific communication. Students will learn to describe and analyze images and discuss ways in which the current standards of bibliographical description can be extended to take account of illustrative content. Rare Book School’s teaching collection of presses, printing surfaces, and sample pages will be used to demonstrate the technical issues surrounding the printing and integration of images in books. Students will practice relief and intaglio printing during the course. There will be sessions in the Albert and Shirley Small Collections Library on Grounds and a field trip to Washington, DC to visit the Cullman and Dibner Libraries of the Smithsonian Institution. During these library visits students will study an extensive range of illustrated books, including some of the most famous books in the history of science, technology, and natural history. The course will be of value to historians, librarians and others who wish to incorporate book history in their research and teaching, to develop their knowledge of early modern illustrated books, and acquire the skills necessary for the analysis and interpretation of these works. In their personal statements, applicants should describe their background, if any, in bibliography and the history of science, though neither is a pre-requisite. Students who have taken I-20 and G-10 should expect some overlap at the start of the course, and will have a valuable foundation for the analytical approach that we will be taking. Roger Gaskell teaches this course, assisted by Caroline Duroselle-Melish. 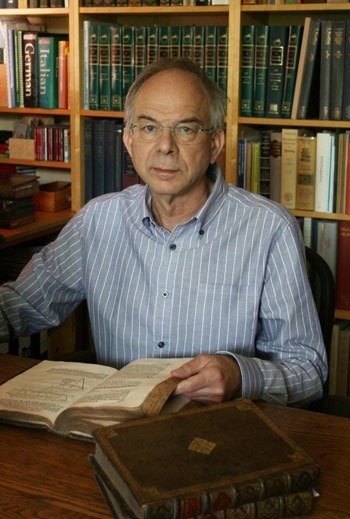 Roger Gaskell is an antiquarian bookseller specializing in scientific medical and technical books, and enjoys working closely with academic libraries in the U.K. and the U.S., and has taught seminars in book history and scientific illustration at the Universities of Oxford and Cambridge and at the Max Planck Institute for the History of Science in Berlin. He has served as a council member of the Bibliographical Society (U.K.).